Most of Europe is struggling with how to reduce spending, but not Norway. 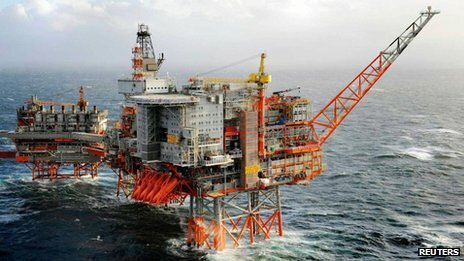 It has invested the income from its oil and gas reserves so wisely that it now has what many consider to be the world's largest sovereign wealth fund, estimated to be worth $1tr (£0.6tr) by 2020. But is that too big? They play the long game on the trading floor. When Facebook announced it was going to float on the stock market, the analysts here went to work. They assessed the pros and cons, the likely value of the company, the chance of a big loss, and of a big gain. Then they bought Facebook shares. Like everyone else who did they lost money almost immediately. Unlike many others however they did not rush to sell them. 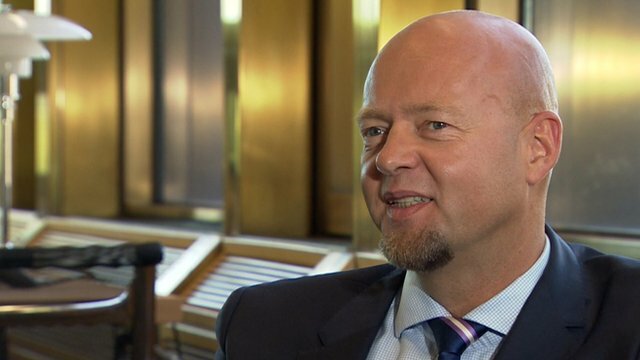 "We have the possibility in times of turbulence to sit through the turbulence," says Yngve Slyngstad, the CEO of Norway's pension fund. A billion dollars a week passes through the fund's office in the Norwegian Central Bank building in Oslo. More than 200 staff work here. Another 100 in their offices in New York, London, Shanghai and Singapore. The trading floor is calm, considered, even slightly academic. Wall Street this is not. There's no panicked selling of stocks as markets plunge. Their mission, by government mandate, is slowly and carefully to build up wealth to help fund this country long after the oil and gas reserves run out. "That was what happened in the 2008-2009 period," Mr Slyngstad continues. "Many other investors were forced to sell. We had the privilege to not only sit on our assets, but to accumulate more." In Norway's case money makes money. Profits and taxes from the oil and gas industry give the government oil fund $1bn a week. The fund holds on average 1% of the world's shares. In Europe it owns more than 2% of all listed companies. That is thanks both to the hydrocarbons – and the fact that successive governments have stuck to the political consensus that profits from the oil industry should be invested in the fund. The government mandate for the fund specifies that it must be transparent and open. It also aims to influence the way in which the companies it invests in behave. It has a set of principles which guide its investment strategies, and to which it attempts to get others to subscribe to. "As long-term owners," says Mr Slyngstad, "we need to "make sure that the companies are long-term profitable, and not only good for the investors, the shareholders, but for society at large. "We work with reason and not with force." "Of course this is very long-term work where results are measured in not years, but decades," adds Mr Slyngstad. 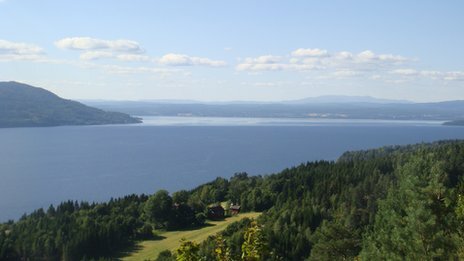 Norway is one of the richest countries per head of population. Europe's debt crisis feels very, very far away in this affluent corner of the continent. At Norway's Business School in Oslo however, the professor of asset management, Bruno Gerard, believes the fund must be changed. 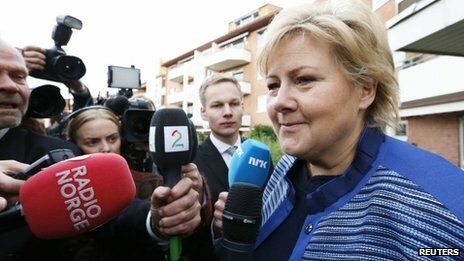 Erna Solberg described her election victory earlier this week as "historic"
"It's going to be impossible to keep managing this immense flow of money within one organisation," he says. "It is very well-managed, but… a small mistake on a big fund can have enormous consequences. It would be far less damaging if we had several smaller funds." That is something Norway's newly-elected Conservative party – it will lead the next coalition government – says it might consider. "Should it be two or three funds not one?" asks Erna Solberg, the party's leader. There will be a discussion, she suggests. "Of course as Conservatives we also believe that if you have a regime with a bit more competition you might get better results." Prof Gerard is convinced that is the way the debate is going. "It's not whether to split the fund – but when to split it." Any change in how they run things in the fund would have no effect on global markets, but it could be crucial for Norway's future. Some say the fund holds too many shares, and argue at least some of the profits would be better spent on infrastructure or research and development in Norway. Spend too much though inside the country and they risk overheating the economy. Mr Slyngstad addresses the issue with a wry smile. "As a starting point it's better to have a large fund than a small fund," he says. But whatever they decide, while most of Europe grapples with how to save, Norway is well ahead. It is focused on making sure that even when the oil does run out, the money doesn't.